Summer time is here and there is nothing like a summer wedding. From ice-cream vans, Candy floss, cocktails in jam jars there are no end to the summer ideas that you can include in your wedding reception. So, where do you go to make that Summer wedding dream a reality this July? 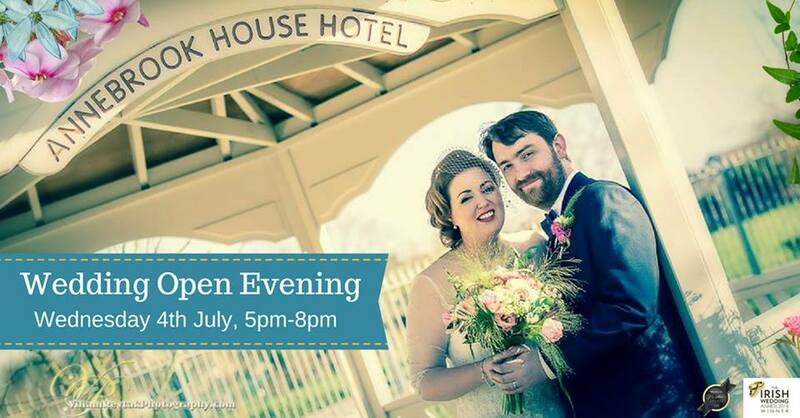 The award winning Annebrook House Hotel Mullingar invite you to their Summer Wedding Open Evening on Wednesday, July 4 from 5pm – 8pm. Enjoy a red carpet welcome, with summer punch & sweet treats on arrival. This informal evening is a wonderful opportunity to see our multi award winning venue fully dressed for a wedding and see just how magical your day could be here at Annebrook House Hotel. Our 17th Century Old House & Hotel will be open to wander at your leisure giving you a glimpse as to how your dream day could turn into a beautiful reality. View our beautiful Edgeworth Suite with a range of dressed tables & centrepieces, our civil ceremony setting and of course our fabulous Bridal Suite, bedrooms & apartments. Our dedicated wedding team will be available to provide one on one show arounds with bridal couples, discuss the many wedding packages on offer, or design a tailored package to meet individual requirements. We look forward to seeing you there!